My Grandmother Doris was from Missouri and moved out west after the family farm failed during the Dust Bowl. So, why is it that I never, until my adult years, wrapped my lips around a black-eyed pea? Guess she just didn’t like them or something… Once I tried them, I was sold. As it turns out, there is a good reason that there are so many of these suckers grown and eaten every year. 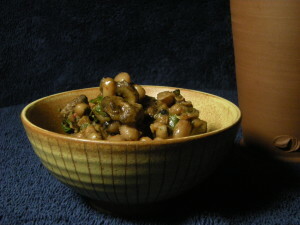 Black-eyed peas are creamy in texture, musky in taste and take a variety of spice additions in stride. They provide a really nice addition to your legume repertoire. Combine this with some mushrooms sautéed in spice and you have an almost meaty dish. I scabbed this recipe from 660 Curries by Raghavan Iyer. Really excellent book, especially if you like legume and vegetarian curries and aren’t reliant on photos. To prepare this curry I use a pressure cooker to cook the beans, since it is eliminates the need for soaking and extended cooking times. The pressure cooker that I settled on was the Fagor 8-Quart Stainless-Steel Pressure Cooker . It is easy to maintain and has a ton of safety features; gets me away from that “I am using a bomb in my kitchen” feeling. It takes only 20 minutes to fully cook the beans and another 10 to blend the sautéed mushrooms and spices; making this a very approachable dish. If you cook a lot of legumes or simply want to use them more in your cooking, but hate the preparation time, a “personal autoclave” is something that you should just break down and buy. Rinse beans and place in pressure cooker with 2½ cups water. Bring to boil, seal and cook on high pressure for 20 minutes. Remove from heat and let cool until pressure subsides. While beans are cooking, slice the mushrooms and heat the oil in a medium skillet on medium high heat. Saute the mushrooms until they begin to brown; about 5 to 8 minutes. Add the spices and cook another minute. Remove from heat and set aside. When beans are done, add mushroom mixture and cook over medium high heat until combined, about 8 to 10 minutes. Moisture should have cooked off, leaving a thickened, saucy dish. Add cilantro during final minute or two of cooking. This is as close to the original recipe as I could stand to write down. In practice, I typically add a teaspoon of ground Korean chili and 1 to 2 Serrano chili in when I saute the mushrooms.